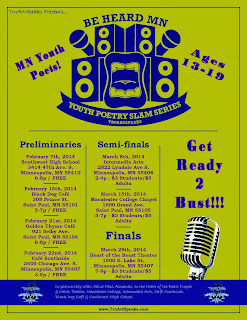 Calling Minnesota youth with brave voices and a sense of rhyme and meter! 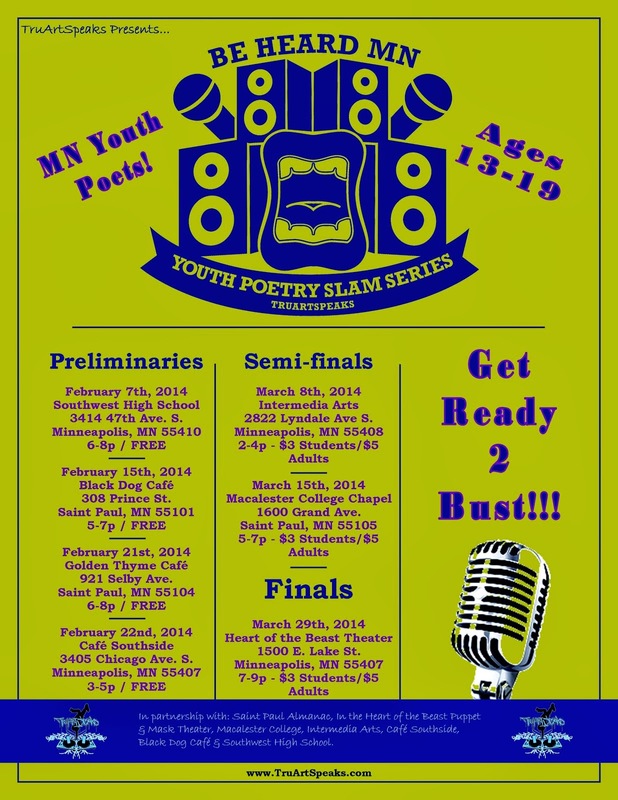 TruArtSpeaks is kicking off the 2014 Be Heard MN Youth Poetry Slam Series in the quest to find six young people between the ages of 13-19 to represent MN in the international Brave New Voices Youth Poetry Slam Festival this summer. Ready your performance or come on out to cheer on these young writers and performance artists! CALLING ALL MN SPOKENWORD ARTISTS AGES 13-19!!! All MN Spokenword artists between the ages of 13-19 are eligible to compete in as many preliminary slams as they desire until they qualify to advance into the semi-final round of the competition. Preliminary slams are free and open to the public. The highest scoring poets from the preliminary slams will advance into the semi-finals on March 8th from 2-4p at the Intermedia Arts and March 15th from 5-7p in the Chapel at Macalester College. The winners of the semi-finals will then advance to the final competition at In the Heart of the Beast Puppet Theater on March 29th from 7-9p. Semi-finals and finals are open to the public at a rate of $3 for student and $5 for adults. The six highest scoring poets from the finals will make up the team representing Minnesota at BNV! "The first time I went to BNV, my life changed." said Tish Jones, former Minnesota youth slam team member (formerly known as Quest for the Voice/MN Quest a program of the MN Spoken Word Association) when asked about her experience with the slam series. "The competition, the travel, the festival, and everything in between were all part of an experience that I will never forget. I made lifelong friends, mentors, and colleagues... I found myself during that process." TruArtSpeaks is a developing nonprofit arts organization that has had a presence in the Twin Cities since 2006. TruArtSpeaks utilizes elements of Hip Hop, Spokenword, and the arts to contest literacy and leadership, supporting a generation of vibrant young voices as they make their claim on the world. We provide a platform for youth to find, develop, study, and share their stories in safe spaces. TruArtSpeaks dares participants to give back and become agents of the change they seek, while remaining students of the culture and histories past. The Be Heard MN Youth Poetry Slam Series is a program of TruArtSpeaks and we would like to thank the MN Spoken Word Association for the work they have done with youth slam in our community. For more information: see www.TruArtSpeaks.com or contact Tish Jones at TruArtSpeaks@gmail.com.